Lacosamide is one kind of white to off-white powder. Its IUPAC Name is (2R)-2-Acetamido-N-benzyl-3-methoxypropanamide. Besides, Lacosamide belongs to Amino Acids 13C, 2H, 15N;Amino Acids & Derivatives;Intermediates & Fine Chemicals;Pharmaceuticals;API. In addition, the Classification Code of it is Anticonvulsant; Anticonvulsants; Treatment of epilepsy and neuropathic pain. 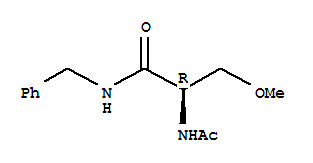 Lacosamide is sparingly soluble in water and slightly soluble in acetonitrile and ethanol. (1)Index of Refraction: 1.52; (2)Molar Refractivity: 67.91 cm3; (3)Molar Volume: 223.3 cm3; (4)Density: 1.12 g/cm3; (5)Flash Point: 278.2 °C; (6)Surface Tension: 41.1 dyne/cm; (7)Enthalpy of Vaporization: 81.31 kJ/mol; (8)Boiling Point: 536.4 °C at 760 mmHg; (9)Vapour Pressure: 1.4E-11 mmHg at 25 °C; (10)XLogP3-AA: 0.3; (11)H-Bond Donor: 2; (12)H-Bond Acceptor: 3; (13)Rotatable Bond Count: 6; (14)Tautomer Count: 4; (15)Exact Mass: 250.131742; (16)MonoIsotopic Mass: 250.131742; (17)Topological Polar Surface Area: 67.4; (18)Heavy Atom Count: 18; (19)Formal Charge: 0; (20)Complexity: 275; (21)Isotope Atom Count: 0; (22)Defined Atom Stereocenter Count: 1; (23)Undefined Atom Stereocenter Count: 0; (24)Defined Bond Stereocenter Count: 0; (25)Undefined Bond Stereocenter Count: 0; (26)Covalently-Bonded Unit Count: 1; (27)Feature 3D Acceptor Count: 3; (28)Feature 3D Donor Count: 2; (29)Feature 3D Ring Count: 1; (30)Effective Rotor Count: 8; (31)Conformer Sampling RMSD: 0.8. Lacosamide (CAS NO.175481-36-4) can be used as a potent anticonvulsant. Lacosamide is a medication developed by UCB for the adjunctive treatment of partial-onset seizures and diabetic neuropathic pain marketed under the trade name Vimpat. Besides, Lacosamide is a potent anticonvulsant.